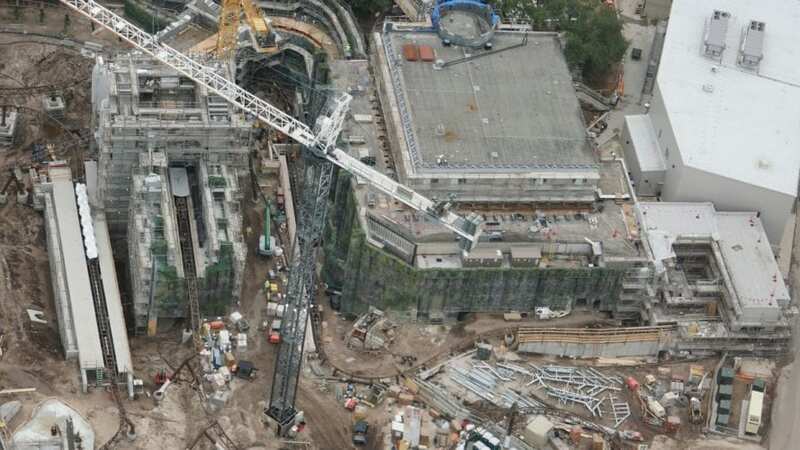 A huge development has taken place recently at the new Harry Potter roller coaster construction! 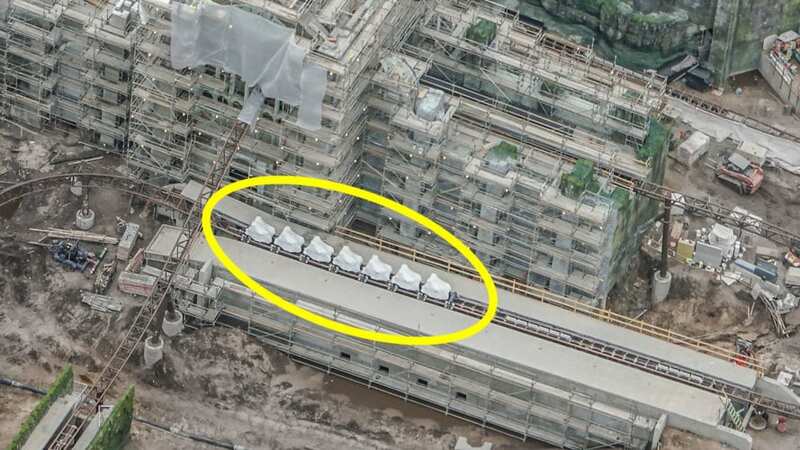 For the first time ever, we can see the coaster train. But, now even more rumors have started. We have heard numerous reports that these are motorcycles. 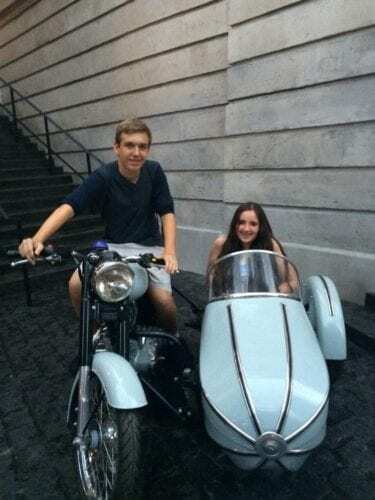 It does seem the most logical choice, with Hagrid’s motorbike and sidecar, plus the cloned Harry Potter motorcycle scene from the Deathly Hallows. It sounds like a perfect vehicle, except for one major detail, the backwards drop. 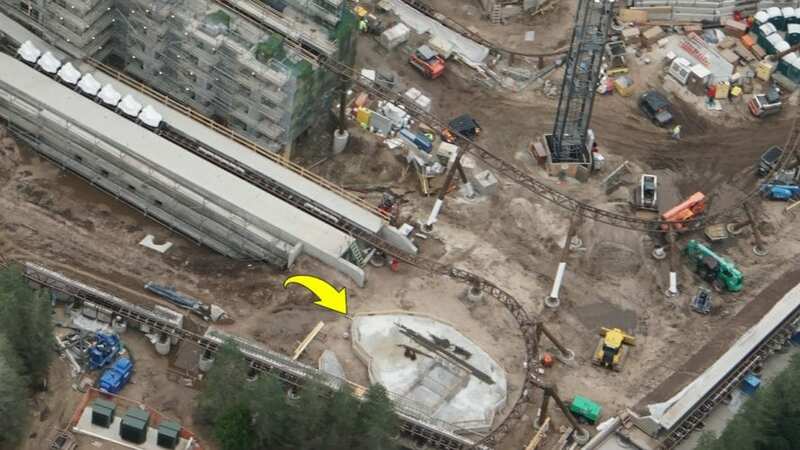 The arrow here points to the track switch which will have guests take a fall backwards and move on to the second part of the track. If this is truly a motorcycle, how would it make sense, story-wise, for a motorcycle to go backwards for half of the ride? Not too long ago at the 2018 IAAPA Attractions Expo, Dynamic Attractions unveiled a brand new coaster concept. These vehicles would be able to simulate flying and jumping and would allow the vehicles to twist-and-turn under full control. While I do not think the coaster train pictured here is that elaborate, perhaps each individual motorcycle can spin 180º. 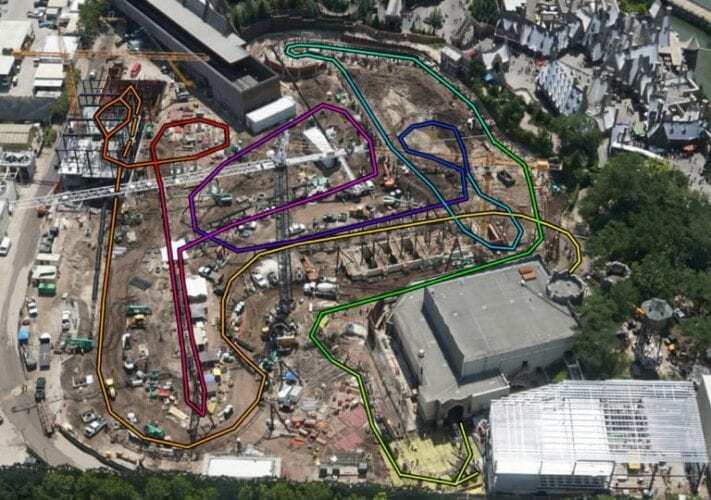 In an earlier construction article from July, we had figured out the full track layout for this coaster. We weren’t sure then the exact direction of the ride path though. Using Photoshop, and pushing each setting to its max, we can actually see a subtle outline of the seats. Now I want you to focus on all of the minute details that seem to separate the left side of each unit from the right. 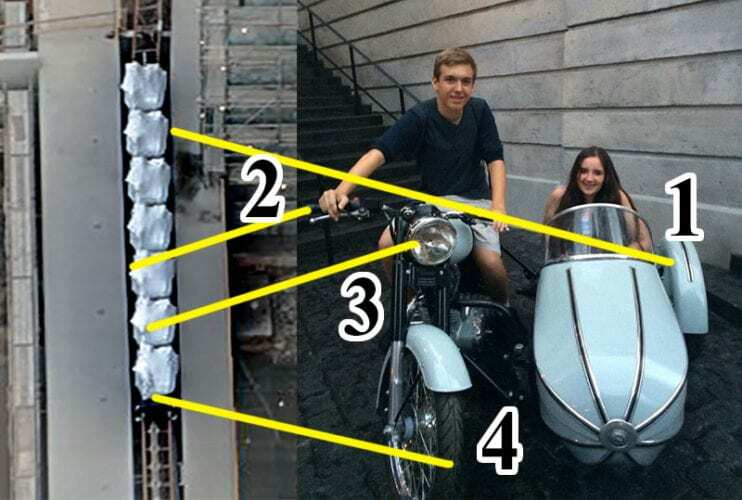 Now, look at this picture of the motorcycle and sidecar from Diagon Alley. 1, we can an extruding piece in the same general area as the sidecar. 2, a sharp extruding point, just like the motorcycle’s handle. 3, a round element poking out in the same general area as the motorcycle. 4, another extruding piece, just like the front tire of the motorcycle. If this is correct, and if the coaster doesn’t spin, then we already know the exact track layout and direction of the coaster. It would also mean that Universal has to have a pretty good reason for why the motorcycles will travel backwards for such a lengthy period of time. Aside from the coaster train, we can also see major progress has occurred on the moss covered ruins theming. According to the concept art, we know that these ruins are situated very close to Hogwarts castle. Even with that info, the internet has yet to decide what these buildings truly are. Old castle courtyards? A section of the forbidden forest we never got to see in the films? To be honest, we are not 100% sure. Let us know your ideas in the comment section below. 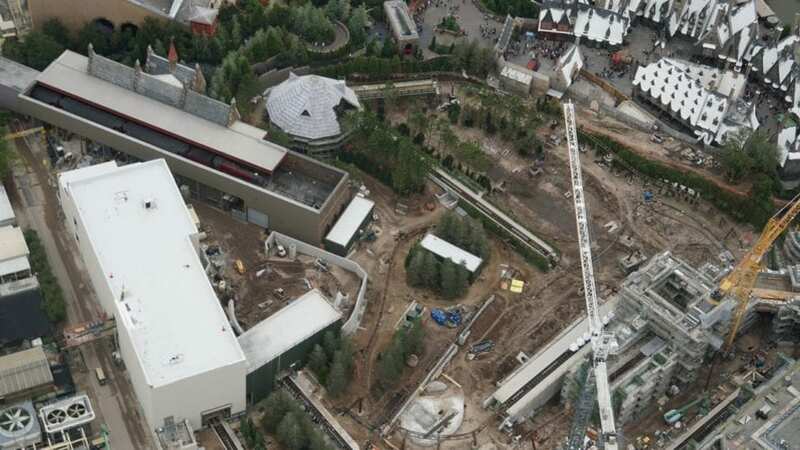 If you read the last Harry Potter coaster construction article you would have seen my guess that water will be a major theming element for this attraction. We still see that trees are isolated in groups and the land dips in very particular areas. 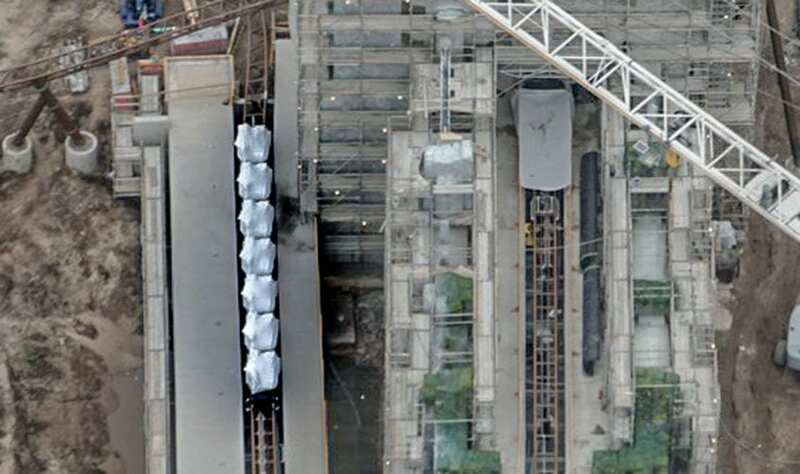 With the new retaining wall around the drop track/elevator building and the 270º turn, I think this rumor is even more plausible. This area here is now being rumored as the placement for an animatronic Fluffy, the three-headed dog that guarded the Philosopher’s Stone. While this creature has been rumored for some time, I would be surprised to see a creature of such magnitude outside. If this info is correct it would certainly be a major animatronic feat for Universal. Backing up, we get a great overview of the area. 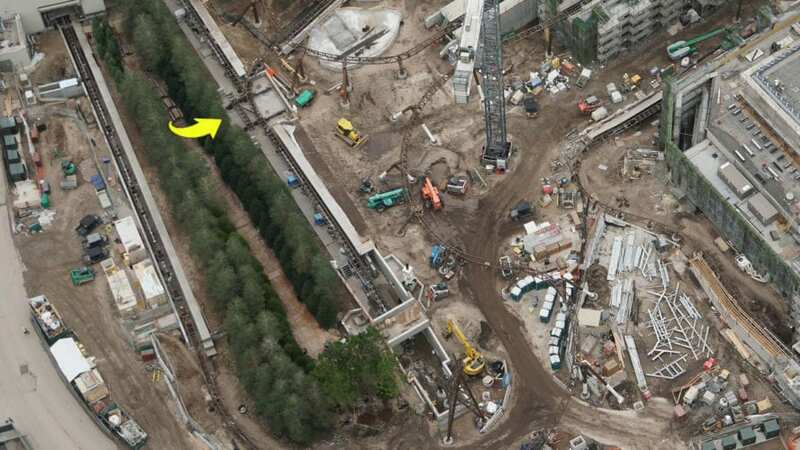 The pathway in the trees on the left are probably just for emergency evacuation procedures and for maintenance to get to the drop track/elevator section of the attraction. I would assume there is still some rather large elements to come since we still have two big cranes in the area. 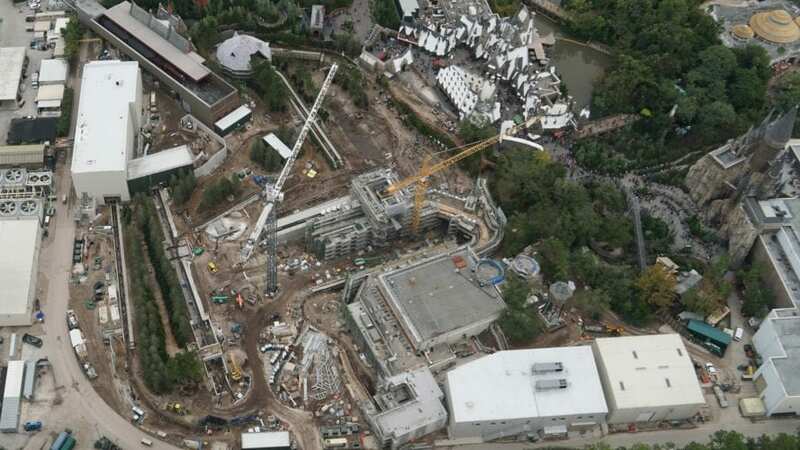 Also, the ruins are now connected to the main show building with a rather large bridge. This new bridge looks beautiful. It also hides the overhead track from the two below. 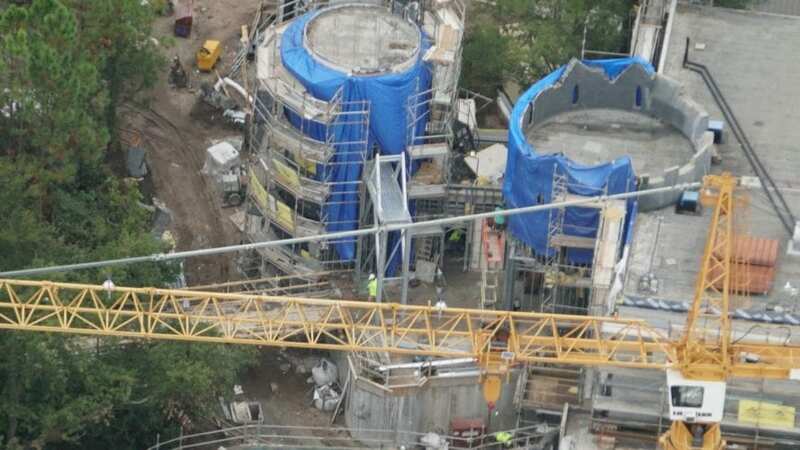 We can see continued work on the ruins theming as well as a new frame in the guest entrance near the blue tarp. 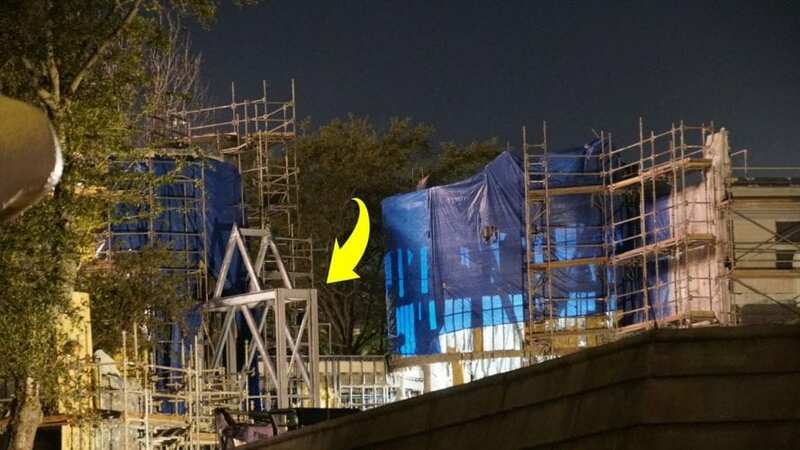 While there will surely be ride signage out in Hogsmeade, this may be the placement of the official ride signage. 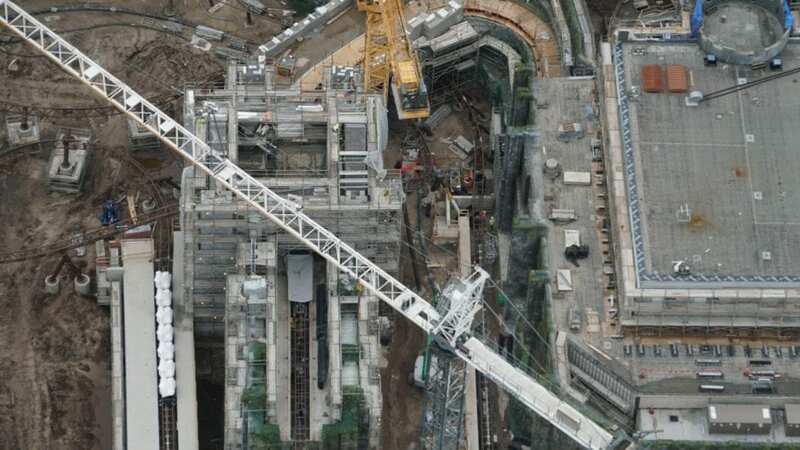 Its proximity to the nearby tower could also mean that this could be steel skeleton for a themed section of collapsed rock. Those rocks could have just so happened to form a perfect entryway for the ride. We have ruins, a hut, and a huge show building as well as the coaster train itself. With the rumored opening next Fall, I expect that we will continue to learn more and more about this mysterious project. 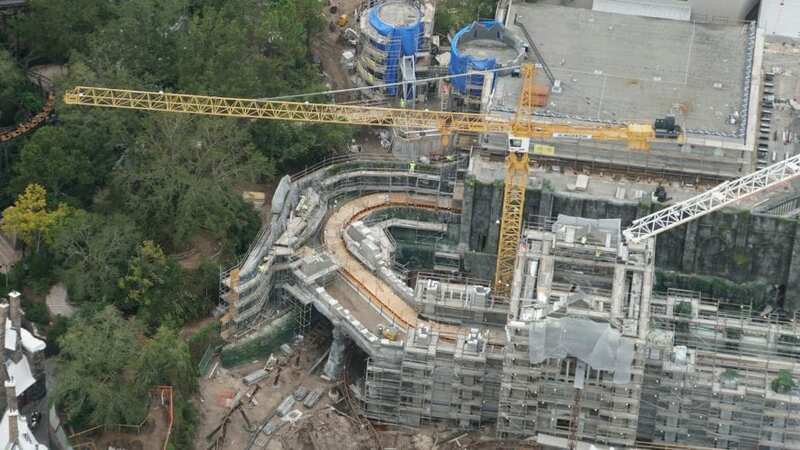 And, speaking of mysterious, it has all but been confirmed that Universal is creating a new theme park near the Icon Orlando, formerly known as the Orlando Eye. 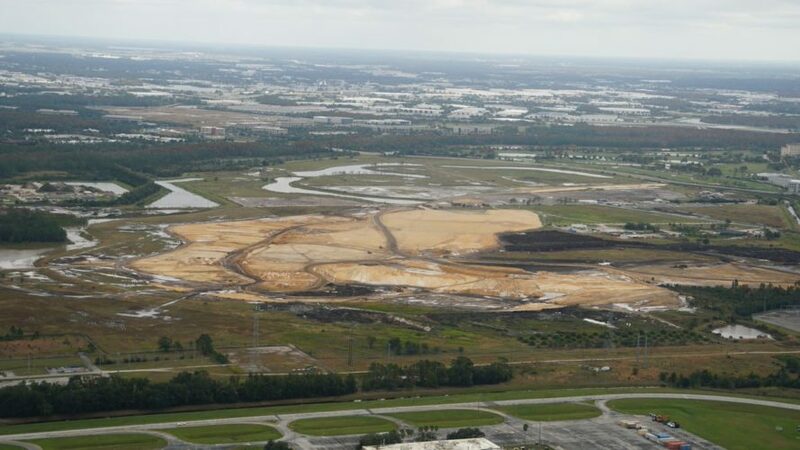 This massive parcel of land has slowly but surely been bought up by Universal. Rumors and a leaked photo point towards this new park being called, Fantastic Worlds. 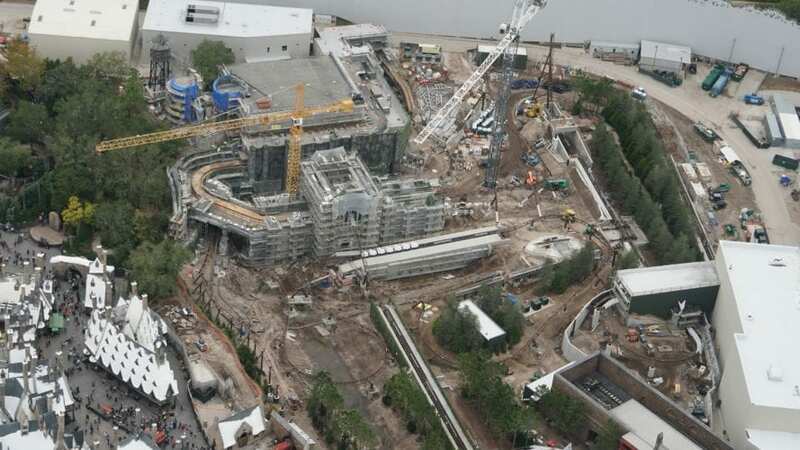 Looking over the rumors of announcements, construction updates and permits, it seems that this park would begin major construction in the next year or two. The goal would be to have this park up-and-running sometime in late 2022 or 2023. With Walt Disney World’s 50th anniversary in 2021, this would take away some of the hype of the new attractions that Walt Disney World is creating for that exact date. Like always, everything stated so far is theory and guesses. Until officially announced by the Universal Orlando Resort, nothing is official. Interested to learn even more about the Wizarding World? Check out these related articles and past construction updates! Perhaps the ride vehicles pivot and rotate when the motion goes backwards?? Just saying.. a rotating vehicle has been done before..